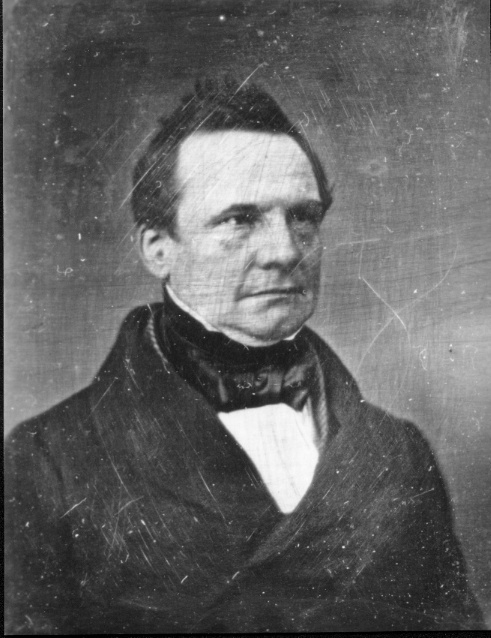 Charles Babbage Esq. mathematical professor at Cambridge and one of the most extraordinary men of the age. Mr. B. though a great mathematician is also a man of the world, fashionable in his manners, of very extensive acquirements, and the most wonderful versatility of genius. In my interview with him, he was by turns playful, profound, practical, always enthusiastic, and always eloquent. He gave the history of his labours to which I listened with intense interest because it was a chapter in the history of the process of mind. He and Sir John Herschell were employed as a committee of the Royal Society I think he said, to make some long & intricate calculations requiring great care and much time -- as they sat at work B. remarked "I wish some one would invent a mode of calculating by steam" -- H. smiled, but both agreed it might be done -- after this the thought occurred to B. again and he rather sought amusement than anything else in devising in his mind how the thing mught be accomplished. One thought led to another until he had contrived a principle sufficient for the purpose of addition merely -- he tried it on a small scale and his machinery succeeded -- he then proceeded a step further, if the machine could be made to print its results as well as calculate them, it would ensure perfect accuracy in mathematical tables, & this has always been a great desideratum, he did devise a plan by which it could print. The Gov't. became interested. Babbage told the ministry that if they would meet the expense from the publick funds he wd. make trhe machine, and to work they went. Here he had to learn a new trade vis making machinery -- the utmost accuracy was necessary, and he had to learn what could be done with metals, and how they were to be wrought. He accomplished this and in doing it made some of the first engineers and workmen now in the Kingdom. At last £17,000 having been expended he made the machine wh. I saw after the labour of 14 or 15 years, and yet it is not much larger than a common work table. The scientific world looked on in delight & wonder, the name of Ch. B_ was known over Europe & America -- the principle of mechanical calculation was settled to be practicable by actual experiment for there stood the machine doing literally as it was bid & almost seeming to think. The wear and tear of mind was prodigious before he reached this result, for he actually had to invent a language wh. he explained to me to record the progress of his mind in the sucessive combinations of his complicated machinery: His memory could not contain them. Just at this point, the infernal demon of political strife stepped in (what had science to do with politics) and government neglected Mr. B. & his labours. He was possessed of the means of living, he was seeking fame & the honour of England not money -- he was no charlatan but a gentleman of enlarged, liberal & scientific mind. He waited patiently and made at last respectful representations until he said, he had to deal with 9 different prime ministers. For the last 4 years government has done nothing & here as he went on his eye kindled & every muscle of his fine face spoke eloquently -- "I have toiled," said he, "at the request of my Country to advance its honour, & have been rewarded by that country with neglect & insult without even the cold compliment of thanks." It was evident that he felt keenly -- his sensibilities were wounded to the quick. Some friends advised him to bring the matter before Parliament, saying if you only get O'Connell to take it up, it will be attended to at once. "I know it," he said, "but sooner would I throw my labours into the ocean than connect them with the dirty politics of the day. As to O'Connell, he is a blackguard & I despise him too much to have any thing of mine touched by him." His resentment was now kindled -- he had laboured long and hard without asking for or receiving a penny, & I make no doubt his resentment quickened his mental faculties. He set to work again taking no sort of notice of government. He taught his son (a fine young man) all that he had done and discovered, that it might not be lost should he die, and took his own road to revenge himself on a country wh. had been ungrateful to him. What he had discovered already led to further advances until he has now actually invented another machine as far superior to the first as the first was to nothing. He showed me all his drawings & explained them to me. He has simplified the machinery & now what he has contrived does not add merely (which was all the first could do) but adds, subtracts, multiplies, divides & extracts the square root!! It is the most wonderful triumph of mind over matter that the world ever saw -- Nay (you will scarce believe me) but in the process of multiplication & division he has taught (as he expressed it) the machine to foresee, i.e. to anticipate the results of the intermediate calculations in reaching the final result. -- "Now," said he, "it is of no consequence whether the Gov't goes on or not. Their machine I am ready to finish as I promised to do when they furnish the funds -- but it is not worth £50 now -- this last one has superseded it completely. Had they acted generously & nobly, this would have been theirs, for generosity would have made me do any thing for them -- but they refused to cooperate with me. I have pursued my journey alone and reached my goal. & now," (said he) " if they ever get it by God! they shall have to pay for it, for they can be made to feel through the pocket only." Francis Lister Hawks (1798-1866) Papers. Referenced in Anthony Hyman's Charles Babbage, Pioneer of the Computer (1982), page 210.